“Honor your father and your mother” was etched in stone during Moses’ time as the Fourth Commandment. This commandment has stood as a reminder to all of us to provide love and care for the elderly so that they may enjoy a long life. The OASIS program of Catholic Charities serves about 750 seniors each year with its main goal of keeping them independent and in their homes as long as possible. A recent national survey found that the majority of aged are as happy now as when they were younger. Being in their own home contributes to their well being. Sure, physical strength, lung capacity, the five senses diminish with age but the majority of older people are not senile and are able to engage in their normal activities. OASIS clients tend to be financially strapped and female. Recently, I visited with a mother and daughter, Elena aged 94 and Helen aged 68, who are living alone with little family support. 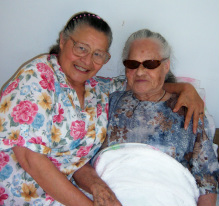 Elena is blind and confined mostly to her bed while Helen is disabled and deals with a painful malady. The on-going maintenance around their 60 year old home is a major issue for them. With few financial resources, the cost of repairing or replacing essential things around the home is a problem. Here is where OASIS staff and volunteers have provided assistance by being an advocate for them. When the roof began to leak and needed repair, Helen appealed to several non-profit and government agencies. She showed me several letters requesting help and said, “OASIS was the only agency that responded and helped get the roof repaired for us”. She added, “OASIS arranged for a volunteer to fix the plumbing and sink by my washer. He worked so hard, I was afraid he might hurt himself. But everything works fine now.” An earlier estimated cost from a plumber to do the repair was $2500.